Adobe Realty is locally owned by real estate brokers Sally Quinn and Sue Weitzman. They opened the business in 1996 in the little red rock building in beautiful Kanab, Utah. Whether you wish to buy or sell a home, Adobe Realty is committed to making this process as stress free and enjoyable as possible. Sue and Sally have built their small real estate company into a leader in the competitive southern Utah and northern Arizona real estate market. Their administrative assistant, Mary Jensen, has been with them since 1997. We are fortunate to have a complete team of professional and personable agents. We serve both northern Arizona and southern Utah with Sally Quinn and Carmen Bradley having licenses in both Utah and Arizona. Sally Quinn is the designated broker with Sue Weitzman as associate broker. Carmen Bradley, Asta Battista, Dan Hall, Ferdie Rodriguez, Pam Medina and Larry Jackson are our professional and able agents. 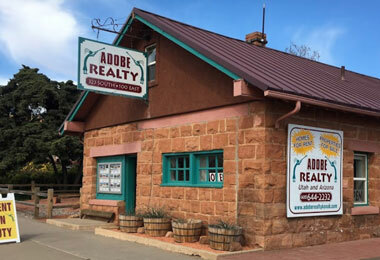 Much gratitude is due for the continued support of the local community and the positive 'word on the street' that Adobe Realty takes care of their customers. Adobe Realty remains strong and committed to you, the customer. We are on the cutting edge of real estate sales in Kane County, independently owned and operated and still simplifying the process of becoming a property owner in one of the most beautiful places on earth!